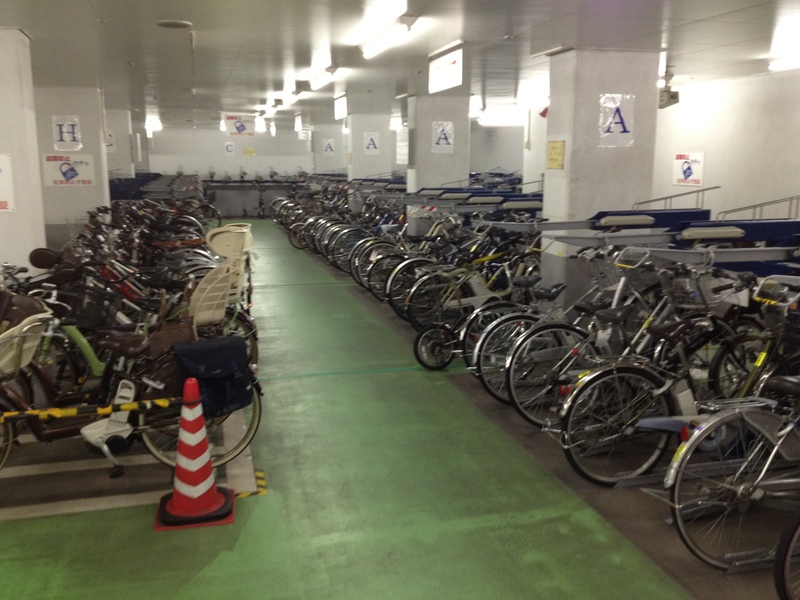 My promised post on bike parking in Japan was a looooong time coming. I have three little kids and a house to clean. UGH. On second thought, let’s not talk about that. 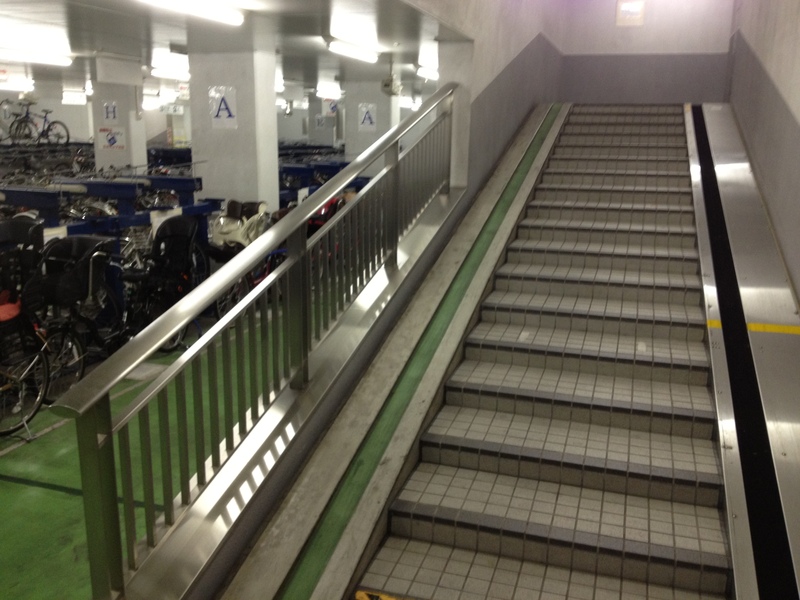 Instead, let’s talk about Japanese bike parking. The solutions that they’ve come up with to deal with all the bikes in their cities is really inspiring (not unique to them, I should note; there are similar set-ups elsewhere). Almost entirely inapplicable to the Lakeshore, but VERY fun. 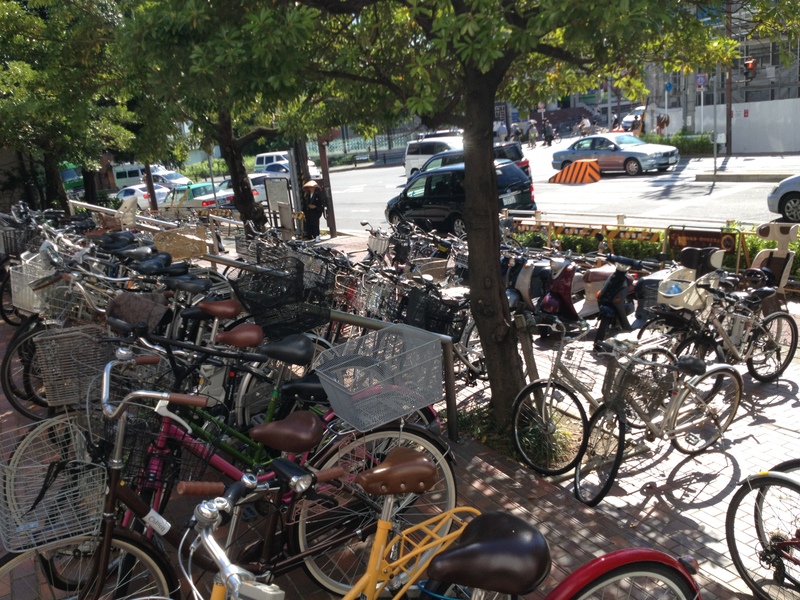 First of all, bikes are EVERYWHERE in urban Japan. Cars are extraordinarily expensive to own and drive, so people ride bikes. Oh, Jusco. How I miss you. 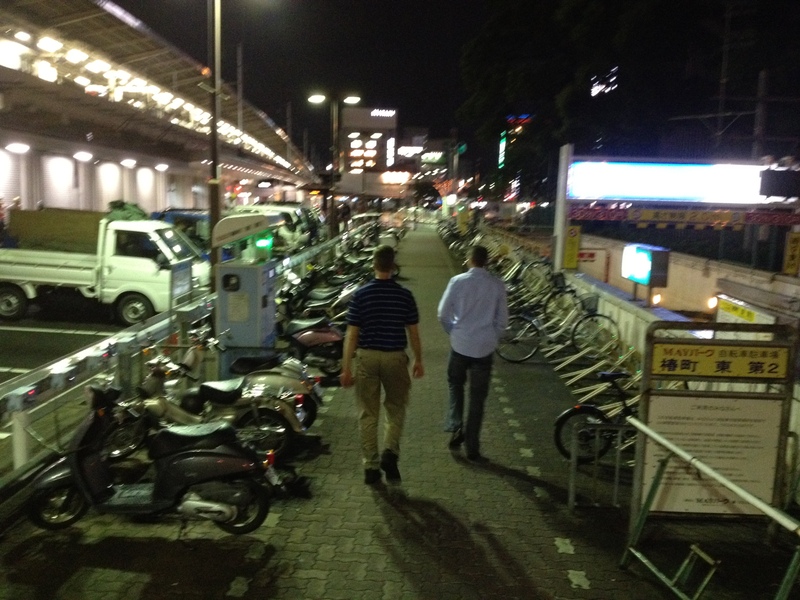 … but here is a much better shot of how many bikes (and again, mopeds) are actually parked outside. Do you see the mamachari to the far right of this picture? If you look closely, you can see a bike with a kid seat on the back of the bike, and a baby seat on the front. Riding in style. Also, way more fun than a minivan. Here’s a simple set-up near the main train terminal in downtown Nagoya. 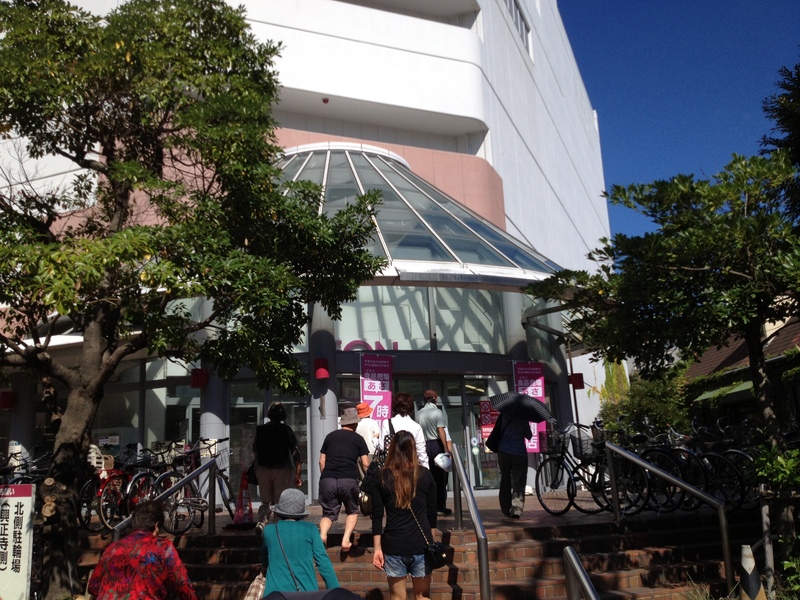 Bike parking on the right – staggered, so handlebars alternate up and down for greater capacity – and moped parking on the left. Mopeds are also very popular. No, the guys in this picture are clearly not Japanese. They are my husband’s big old Western colleagues and are easy to spot in a crowd of twenty thousand. I speak from experience. Okay, next the subway station near our house. This is a covered, paid parking lot at the Sogo Rihabiri Center station. On the right-hand side of the picture, you can kind of see the booth where you pay at in the background. If I remember correctly, it’s normally staffed, but I didn’t pay much attention at the time. This is a pretty new station and is in a less dense area, which is probably why they were able to find space for this here. 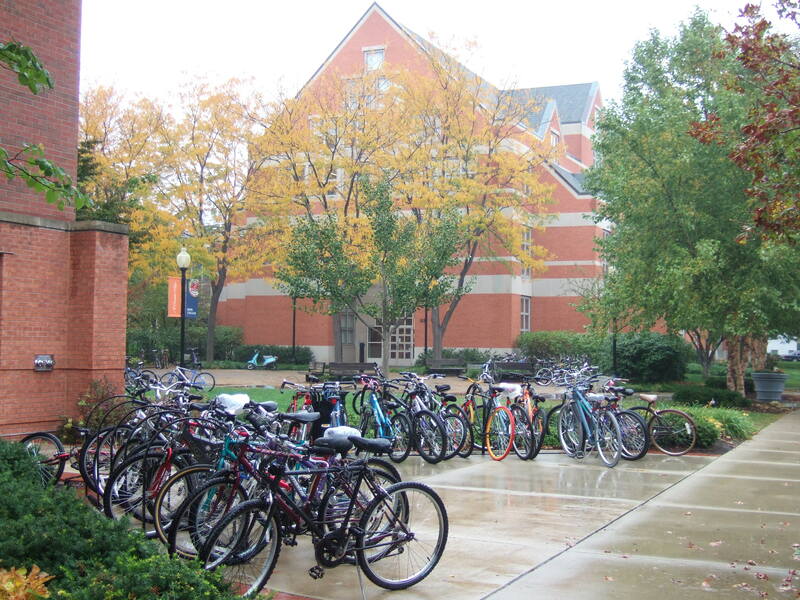 Now we get to the stuff that’s almost unfathomable to most Michiganders: underground bike parking. 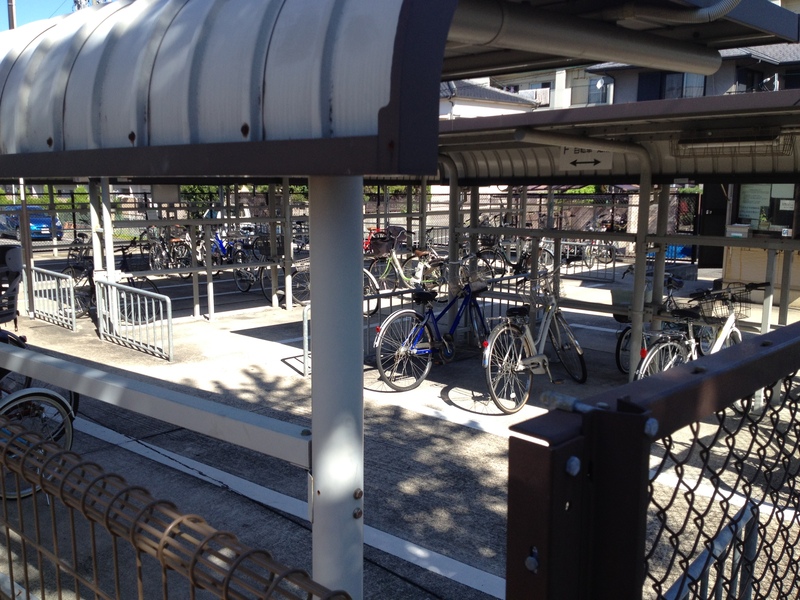 A lot of people ride their bikes to the subway station, so there’s tremendous need for bike parking there, obviously. Underground parking to the rescue. A couple things to notice if you look closely. 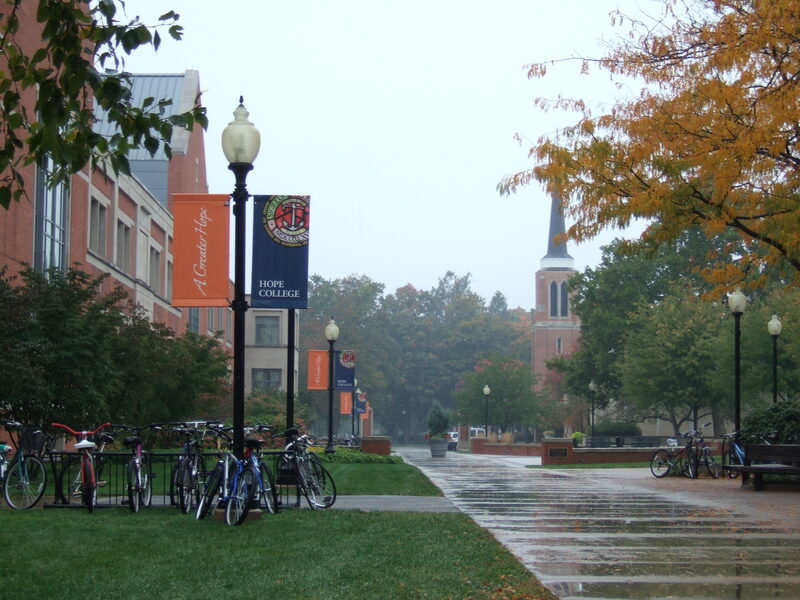 First, this is a double-rack system – on the right-hand side, there are additional racks above if needed. You can see one bike on one of these in the background of the previous picture. Also, there are more mamachari on the left, and on the right you can see a folding bike (it’s the one with the little wheel). I haven’t seen many of these in Holland yet, but they’re a great solution for small spaces and for carrying around. For more images of Japan, check out this article on Japanese bicycle infrastructure and this photo of a narrow city street.